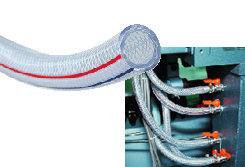 Industrial standard pressure hose for its stability under pressure. Due to a pliable material, clamping is easy. Fast installation. Due to high elasticity, excellent resistance against degradation.